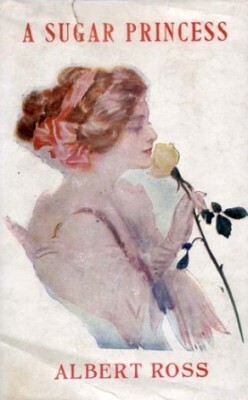 Albert Ross : A Sugar Princess, 1900.
: G.W. Dillingham, New York, c1900. A romantic novel with some chapters located in Hawaii, where the "Sugar Princess" of the title includes surfboard riding amoung her attractions. 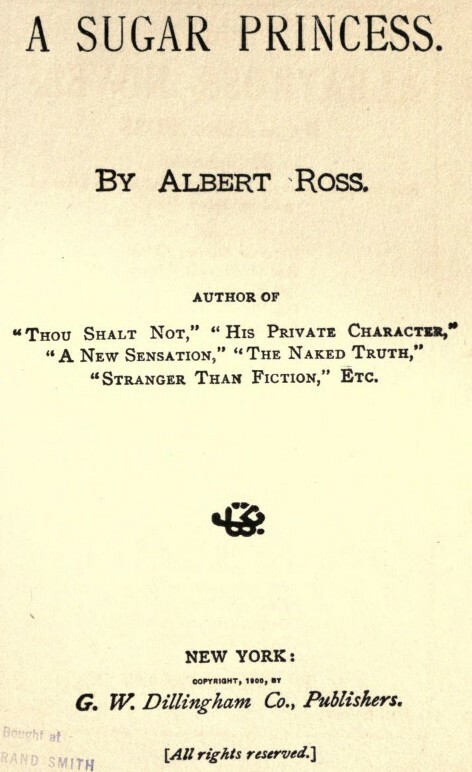 Albert Ross was the pseudonym of Linn Boyd Porter, 1851-1916. Linn Boyd Porter arrived in Honolulu from San Francisco on the S.S. Coptic on 4th May 1899. - The Hawaiian Star, May 5, 1899, page 2. In a letter to Mr. Hayward of the Waikiki Inn, Lenn (sic) B. Porter advised that "his novel to be published in July 1900, will contain some reflections of his life and stay in Honolulu." - The Hawaiian Star, February 6, 1900, page 1. For sale by V. H. Burghardt, Salem, Oregon,"
- The Daily Journal (Salem, Oregon), August 28, 1900, page 2. A hardback copy cost $1 and the paperback edition was 50 cents. - The San Francisco Call, August 26, 1900, page 16. The soup was hardly served before Mrs. Bently began to whisper question to the purser in relation to the Van Steubens, whose backs were toward the party, as they sat in a row at the Captain's table. The great subject was too important to drop even in the midst of a meal. "You've heard about that terrible accident, of course? Wasn't it a narrow escape! I was talking with Mrs. Dexter she's a great friend of the Van Steubens', and she said it was simply awful. Amy's got over it well, hasn't she? You can't see any trace of it. Those Honolulu girls are so strong. They say she didn't mind the wetting at all, and never once lost her presence of mind." "There never was any real danger. Miss Van Steuben learned to swim when she was a child and with the little Kanakas has ridden a surfboard in the breakers at Waikiki many a time." "But she had no surfboard here," said Mrs. Bentley, determined to maintain her thesis. "And it's not so easy swimming with a woman's clothing around you; is it, Mr. Lovejoy?" She appealed to the clergyman, to Whom she had been introduced but five minutes before, having a general idea that whatever side a sister took would be henceforth unassailable. "I really 'have had no personal experience," was the stammering reply, "but I should suppose not." "It is generally understood," said the purser, springing into the breach through the first opening, "that women float longer than men. I've heard that where a husband and wife were lost together at sea, the jury disposed of the estate on the theory that the wife probably lived some seconds the longer, and therefore inherited her legal share of her husband's property, which thus went to her heirs." The two daughters of Mrs. Bentley exclaimed, "How dreadful!" but exactly what they meant by it has never transpired. "At any rate," said their mother, "a man in a boat sprang after Miss Amy and held her up till she was pulled aboard the tug. I got that straight and it was in the newspaper too. And then, not even waiting to be thanked, he rowed away. In these times it does one good to hear of an honorable and brave action without hope of pecuniary reward." Our young friend stood on the sidewalk till the parade had passed, but the shouts and music jarred on his overwrought brain. slowly up to Waikiki and took a long swim among the breakers. The beach was a scene of gaiety interesting to be-hold. Hundreds were there besides himself. Occasional groups of native boys and girls were to be seen, as much at home in the water as a school of fishes, and in many cases clad in raiment hardly more elaborate. The survivors of the Hawaiian people are not hampered very seriously in their old habits by tihe white residents. Their brown skins, apparently of the texure of velvet, answers very well for a covering, and regulations which custom has prescribed for the lighter races are stretched good-naturedly for them. This beach is so shallow that bathers can walk three or four hundred yards from shore without finding the water above their necks, if they are careful to avoid a few spots where the shelving sand takes a sudden and deep descent. Far out from the land are reefs over which the waves break deliciously, and there the native surfboard is a delight both to the Caucasian and Kanaka. When he had been in the waiter nearly an hour, Carl became aware that among the swimmers near him were young Van Steuben and his sister. Billy recognized him and nodded pleasantly, while Miss Amy stole a giance in his direction as if she remembered seeing him before. "Splendid surf, isn't it?" said Billy, when he got nearer. "We've known this beach ever since we were babies, and it's grand to get back to it again. You're making quite a stay. I hope you'll find our little island interesting." Carl answered with some uneasiness that it was a very beautiful place. The closeness of Miss Amy, who was but a hundred feet away, confused him. He could not quite get over the fear that she would address him suddenly with, "Aren't you the man who rescued me at San Francisco?" Miss Van Steuben was not of the build which is considered tihe true type of a water nymph by artists and novelists in general. She was too slender to fill tihe picture usually drawn. But to the eyes that now watched her she was very lovely in those clinging garments, with her dark hair half hidden under the oil-skin cap. Her face lost nothing of its charm with the exercise and her laugh rang out like music when she placed her surfboard before her and let a huge wave carry her with the speed of a racehorse toward the land. "She can swim like a porpoise," laughed the brother, as he caught a nervous look on Carl's countenance. "She learned that playing with the little Kanaka girls when she was a mere baby. Yes, I'm coming!" he shouted, as Amy signalled to him. Carl realized perfectly that he was desperately in love with this siren, but he realized still more that his passion must be a hopeless one. He was even in debt for the amount of his fare to the island and the price of his board at the hotel. He felt a sharp pang as he reflected on the wide distance that must henceforth separate him from every ambition but the sole one of earning an honest livelihood. He turned his face resolutely away from his fascinator and, returning to the bathhouses, pulled off his bathing suit and stood for some moments under the cooling water of the shower bath. When he was dressed he slowly strolled back to town. Street cars passed him, crowded with merry passengers, Hawaiians, Chinese, Japs, Portuguese and the nondescript population which is growing out of their intermarriages. Geoff Cater (2012-2016) : Albert Ross : The Sugar Princess, 1900.